This type of wooden table with a ceramic tile top held trays of food and drink. It would have used in an Ottoman palace, set before guests who sat on a low bench, or divan, built against the walls. 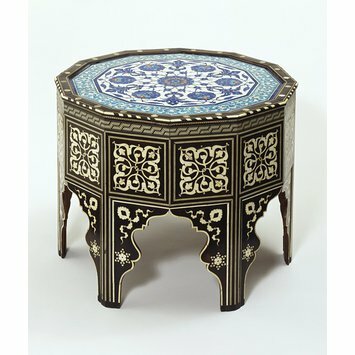 Many large polygonal tiles survive from the Ottoman period, but this example is one of the very few that still serves its original purpose as a table top. It was made in Iznik, north-west Anatolia, which was known as a centre of ceramic production. Body of the table: wood inlaid with ebony and mother of pearl; the top: fritware ceramic painted under the glaze. The tile has twelve sides, but the table is constructed with spandrel-like joins between the legs so that it stands on six legs. Table made of wood faced with ebony, ivory and mother-of-pearl, the table top a twelve-sided Iznik tile, Turkey (Iznik and Istanbul), ca. 1560. In Ottoman palaces, guests sat on a low bench, or divan, built against the wall. Trays of food and drink were set before them, resting on tables of this type. 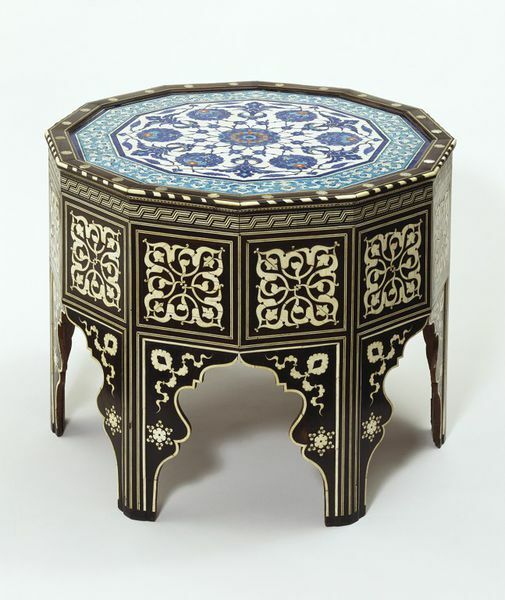 Many large polygonal tiles survive from the Ottoman period, but this is one of the very few that still serves its original purpose, as a table top. In Ottoman palaces, guests sat on a low bench, or divan, built against the walls. Trays of food and drink were set before them, resting on tables of this type.